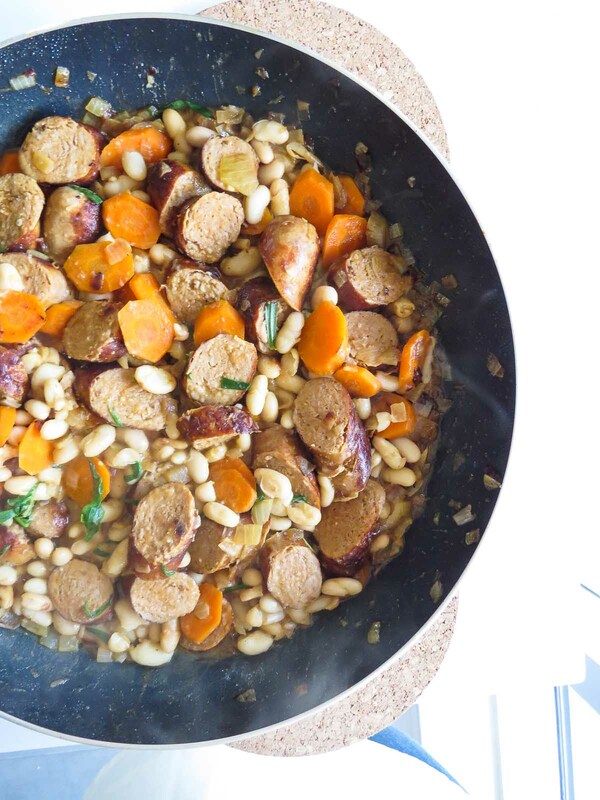 Tied together with sautéed onions and carrots, this Sausage and Cannellini Beans in White Wine recipe has all the wonderful deliciousness cooking in one pan! 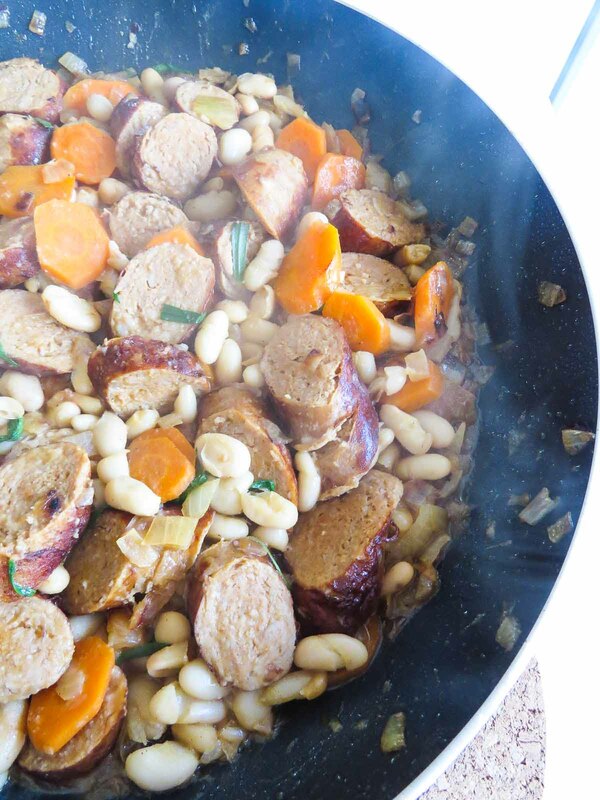 Sausages, onions, carrots, beans… WHITE WINE! NOM, NOM, NOM, NOM… WHITE WINE! Really, this time I mean it, I should leave it at that. The photos of the sausages explain the juicy flavour, the beans explain the heartiness of the meal, and the colour of the carrots and the tarragon make it beautiful (also props to the natural light coming through my boyfriend’s kitchen window). Of course what you’re not getting by reading the post are the wonderful smells of the the sautéing onions and the sizzle of adding the wine to the pan… but soon, when you decide to make this recipe, you’ll understand. But for now, take in the juices on the cutting board and the steam rising from the pan in the pictures. Quick little story about how this recipe came to be?! I left work a little earlier last week thinking I’d pick up groceries and cook a nice homemade meal, having it ready for my boyfriend when he got home from work. So I took the metro from my lab to the grocery store being able to pick up everything I thought I needed taking a nice walk back to his place. Then, as I was leaving the grocers, I realized that I did not have my key to get in and was forced to wait until he got home to start cooking: epic fail but not the end of the world! I went to our regular pub and had a glass of wine thinking about how to cook this meal, and cook it in under 30 minutes because I was hungry! … Maybe a lot of green. 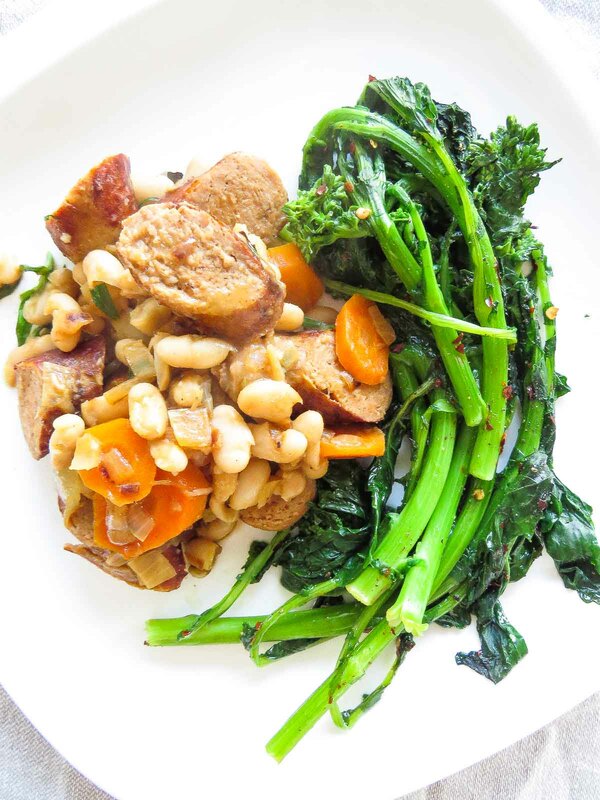 I ate half a bunch of rapini that night AND the sausage and beans, which definitely lead to a tasty food coma. Something I’ve kept in the recipe through it’s development but if I’d make it for myself again I’d omit: tarragon. 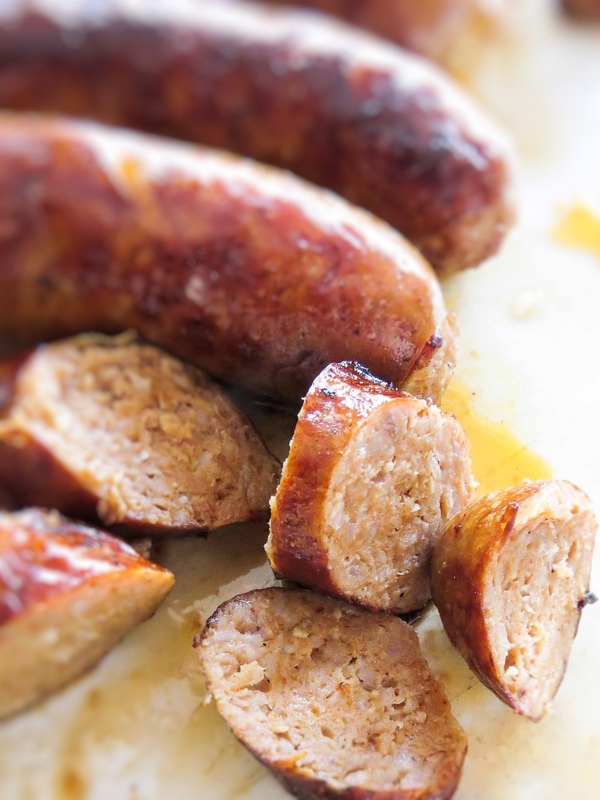 I don’t particularly like the taste of fennel seeds in sausage and although I don’t buy sausage with fennel in it, I find the tarragon added to this dish give the same flavour. 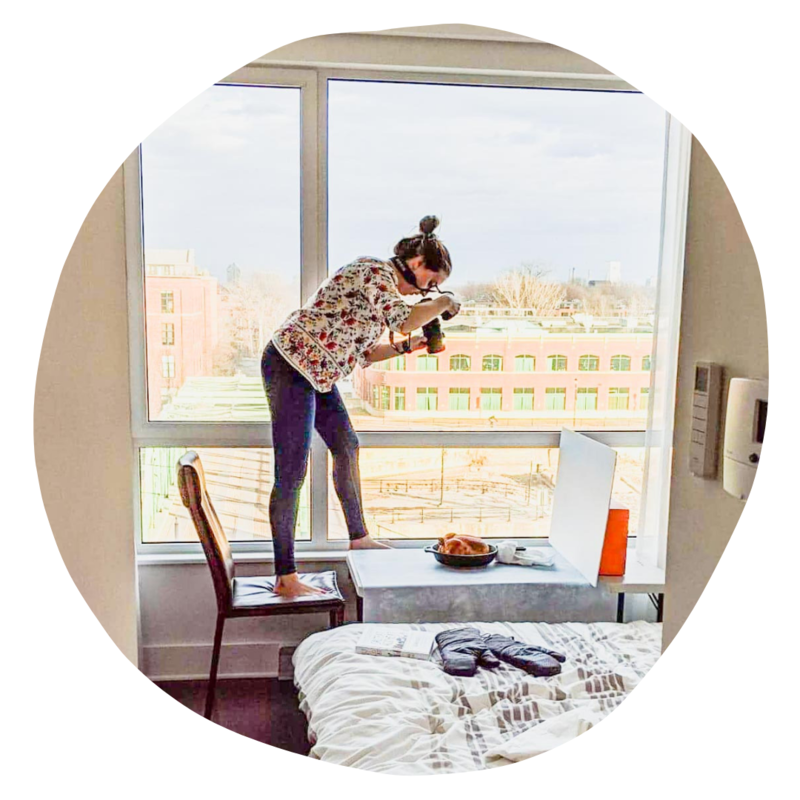 By all means, follow the recipe and decide for yourself! I didn’t take to tarragon in this instance, but mix it in a pear sorbet and I’m all heart eyed about it – it’s definitely a particular herb. Tied together with sautéed onions and carrots, this Sausage and Cannellini Bean in White Wine recipe has all the wonderful deliciousness cooking in one pan! Heat oil in a sauté pan over medium-high heat. Add the sausage and cook until well browned on all sides and cooked through, about 10 minutes. Remove from heat and let rest for at least 5 minutes. Meanwhile, sauté the onions and carrots until tender, about 8 minutes, and season with salt and pepper. Add the wine and beans and simmer for 5 minutes. 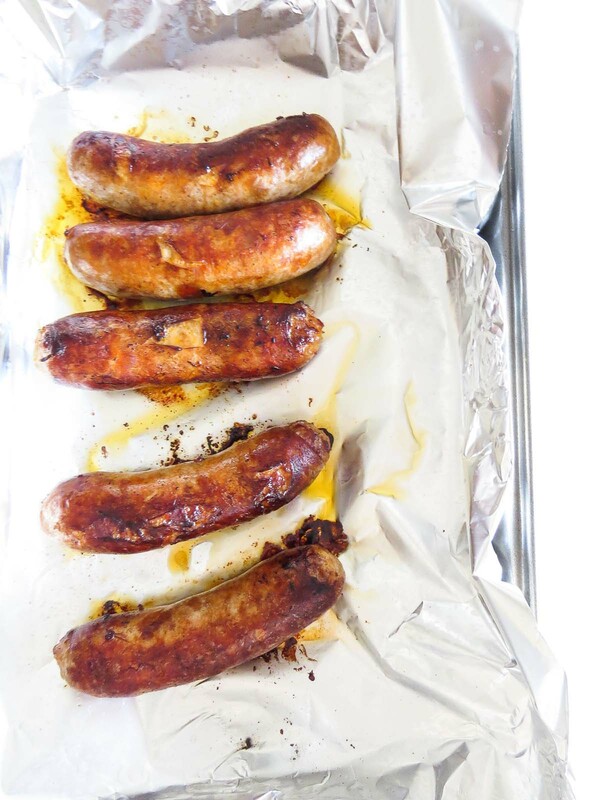 Cut the sausages into slices and return them to the pan with the tarragon. Stir and serve.